If there's one thing a donut hunter begins to learn very quickly it's that the hours posted by many independent donuts shops, those hidden little gems which we all seek out, can have very little to do with what times they are actually open; especially when they are just plain closed. Case in point, this past weekend, Brother's Donuts, Franklin NH. Don't try to go on Sunday, they are closed. Not that this is in anyway their fault, but let's just say the over excited exuberance the average donut hunter may have when running on empty can cause them to wake up at 5:30am on a Sunday and wildly drive out into the country side without even a second thought as to whether or not their destination would be open; this is why phones were invented, you already know that; now I do too. 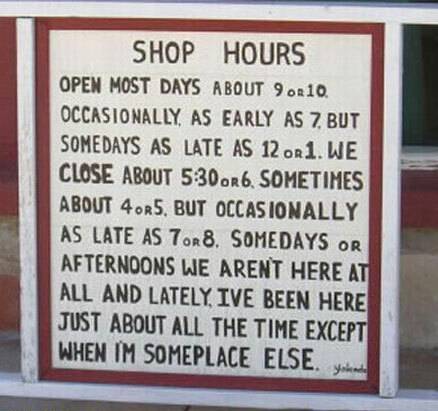 The flexibility of hours which can occur at many of the best shops has little to do with the shop owners having a willy-nilly work ethic, but rather speaks to just how good their products are and how high the demand for them is. When the donuts are gone for the day, the hours end. Case in point is Ziggy's, Salem MA. Ziggy's is a small, family run shop that is so tiny and obscure you can almost miss it if you've never been there. Driving by Ziggy's and getting lost for just 15 minutes can be the difference between getting one of the best donuts in town or going home empty handed; call ahead they will put yours aside if there are any left. In fact, calling ahead is a great practice to have with any small independent shop. I have found that most shop owners will happily give any donut hunter directions and put a few aside with your name on them waiting for your arrival. Now, what do you do if, like me, you don't call ahead and show up to find that the shop not only has no donuts but is closed? You can take 1 of 2 routes: 1) find the nearest large chain and succumb to filling your belly with the empty calories of a hollow, unfulfilled mass-produced doughNOT, which is about as good as hiding in a corner crying for an hour, or 2) hope that your shop does some wholesale business with local gas stations and coffee shops in the area and search out the "Day Old's"; Brothers does just that. It didn't take me long to find a station down the street and hunt up a few jelly's, an apple, Boston cream and the like. The best thing about Day Old's is that a few minutes in the microwave is like a donut time-machine -crisis averted. Let my lessons point the way to donut bliss, call ahead, check hours and reserve a few before you make the trek; you'll be glad you did.